Elise Sabato is proud of her husband, Brad, for serving his country…and grateful when he returns home to her. But the traumatic brain injury he suffered in Iraq has turned him from a thoughtful, brilliant, and patient man into someone quite different….someone who requires more care and attention than Elise can give while working in a demanding law firm. And when Brad ends up on his family’s farm, hundreds of miles away, she wonders where their marriage is headed. Erin Celello was born and raised in the Upper Peninsula of Michigan, where she also earned an MFA in fiction from Northern Michigan University. She now lives in Madison, Wisconsin, with her husband, son, and two unruly Vizslas. She teaches writing at the University of Wisconsin-Whitewater. 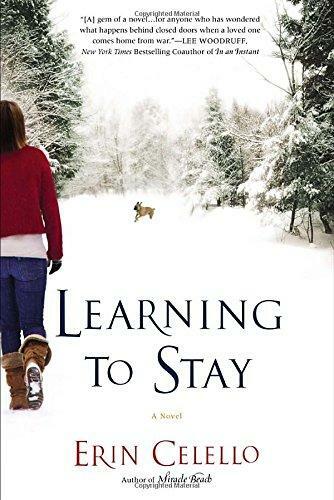 What was your general reaction to reading Learning to Stay? Did you know anything about post-traumatic stress syndrome and traumatic brain injury before reading the book? What did you learn that most surprised or shocked you? Discuss the company culture and expectations at Elise’s job at the law firm, within the context of the novel and from your own job experience. Are they unrealistic expectations, or necessary ones? Do they exact too high a price? Is it a price you would be willing to pay, especially during this time of high unemployment? Discuss Elise’s efforts to get Brad help. Does she do enough, or does she pack him off to his dad too soon? Not soon enough? Would you have handled the situation differently? Should more tax dollars go to supporting U.S. veterans? Have you seen indications that more services are being made available? What additional programs would you like to see? Learning to Stay is, at heart, about a marriage in crisis. Is it fair to say that the marriage is saved by the dog Jones? Animals can perform amazing services for humans. Discuss the stories you’ve heard, or personally experienced, in which an animal enriched, or even saved, a human life. Darcy thinks Elise should stand by Brad no matter what. Sondra urges her to leave him. If you were in Elise’s situation, what would you do? Do you think Elise should go ahead and have a child with Brad? What kinds of questions should a couple consider when deciding whether to have a child? Compare the life Elise might have had with Brad if he hadn’t gone to Iraq versus the life she expects to have with him at the end of the novel.